Aaron Tveit. Need I say more? Alright, fine, I will. This beautiful man has played many a leading lad on Broadway and he has most recently won the hearts (including mine) of those who have ventured to the movies in the past week to see Les Miserables. 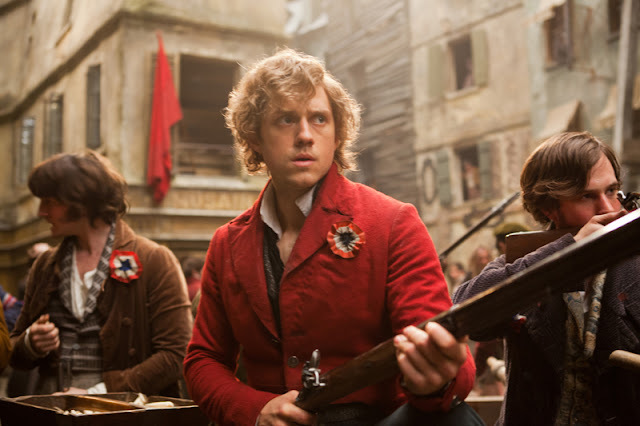 Although I am deep in the world of theatre, I knew very little about this musical except that it was indeed a musical and that it was about the French revolution. Otherwise, zip. Nothing. Nil. Then we began hearing about the movie and I became incredibly excited to see some of my favorites in action: Anne Hathaway, Eddie Redmayne, and even Hugh Jackman. I'll go more in-depth about this movie (believe me, you'll get an earful) but I was altogether quite pleased! It is long, so be prepared, but a masterpiece. Stunning performances by almost all and our boy Aaron (can't he be mine?) will convince you to join him in the fight for certain. As far as resolutions go, this new year I've come up with a few of my own, as per usual. Any of them match your list? "Be devoted to one another in love. Honor one another above yourselves. Never be lacking in zeal, but keep your spiritual fervor, serving the Lord. Be joyful in hope, patient in affliction, faithful in prayer. Share with the Lord’s people who are in need. Practice hospitality. Bless those who persecute you; bless and do not curse. Rejoice with those who rejoice; mourn with those who mourn. Live in harmony with one another. Do not be proud, but be willing to associate with people of low position. Do not be conceited. Do not repay anyone evil for evil. Be careful to do what is right in the eyes of everyone. If it is possible, as far as it depends on you, live at peace with everyone."